Are you ready to celebrate Culture Days? 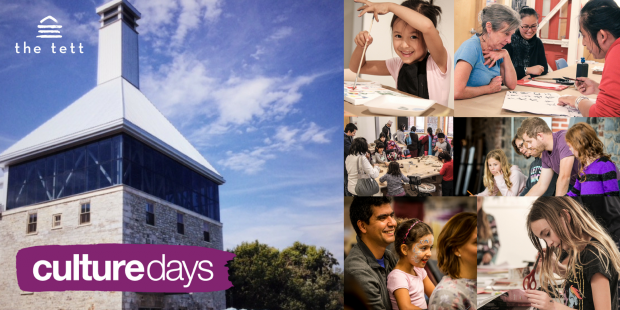 The Tett Centre is enthusiastically preparing for this exciting, engaging 3-day event that is free to the public and helps connect the community with diverse hands-on and free arts and culture activities in the city! Join us at the Tett Centre for Creativity and Learning! Don’t forget to visit www.culturedays.ca to view the full city-wide events calendar. The Tett Centre is proud to offer a meaningful and interactive artistic experience that fosters creativity, helps develop new skills, and inspires students to express themselves! By joining this innovative, engaging and educational visual arts program, students will have the opportunity to work alongside local artists, tour the Tett Centre, and immerse themselves in the Tett Centre’s lively waterfront arts hub. View the incredible textile art, handmade books and paintings by Peta Bailey, Linda Coulter, Janet Elliott and Janine Gates in the Tett Gallery. Kids Creativity Club is a Saturday morning drop-in art program at the Tett Centre for Creativity & Learning. It is an opportunity for children and their families to experience the arts together. Each week participants can enjoy a variety of hands-on, creative arts activities with local artists and volunteers. Come and explore, create, and be inspired at the Tett! Join Christina MacLachlan for an Autumn-inspired Kids Creativity Club event! Experiment with autumn leaves and found-object rubbings using pastels, crayons and various papers. Create a beautiful seasonal tree incorporating vivid colours, unique textures, and natural foliage. All ages. View the incredible textile art, handmade books and paintings by Peta Bailey, Linda Coulter, Janet Elliott and Janine Gates in the Tett Gallery. All ages welcome. Join Joanna Dermenjian and help create 500+ felt poppies, one for each soldier from the Kingston area who died in WW1. Individual felt poppy circles will be hand-stitched together to create a banner which will be displayed for Remembrance Day and afterward. The centre of each poppy will be embroidered with the initials of a specific soldier who died during the war. We invite families and individuals to partake in this fantastic community initiative! In Kingston, local dancer Kay Kenney has been selected as a 2018 Culture Days Youth Arts Ambassador for her project, Movement Market / DANCE as COMMUNITY. Kay’s artistic program will feature two choreographic movement workshops and two performances. Featuring thirty volunteer community members with a passion for performance art, Movement Market will use dance as a medium for self-exploration, building towards a choreographed performance accompanied by local musician Claire Bouvier on Sunday, 30 September in Market Square. Deadline to register to participate is 15 September. Details: http://www.artskingston.ca/culture-days/. The Isabel Bader Centre for the Performing Arts and The Tett Centre for Creativity and Learning present the Joe's MILL Instrument Petting Zoo! Drop by The Isabel Lobby and visit a violin, feed a flute or plunk a piano. Our instruments are happy to hang with you as you get to know how they sound, and well, who they are! All ages. Learn how to make your own Gem Stone Tree with Heather Kushum Sheedy, using craft wire and gemstone beads. All supplies and tools provided. Parents should accompany their own young children for the class. Open to all skill levels 6 years or older. As spaces are limited to 8 per session, please register in advance by emailing Eileen Moss at emoss@cogeco.ca. The Begin Again Group (B.A.G. Project) creates eco-friendly, vegan purses and designer bags, made out of recycled rubber. Families are welcome to drop-in and enjoy creating crafts out of recycled rubber. In addition, every bag purchased will support newcomer women and their families. All ages. Bring your imagination to the Creativity Studios, and work alongside resident Tett artist Magaret Meban! Explore various hands-on, multi-media art processes, and create your own contemporary masterpiece! All ages. Free while supplies last. Don’t miss Modern Fuel’s latest exhibition! Modern Fuel is a long running cultural non-profit group facilitating the presentation, interpretation, and production of contemporary visual, time-based and interdisciplinary arts. All ages welcome. Light refreshments provided. Watch or take part in this lively and interactive musical life drawing experience. Tim Rosillo will guide participants in gesture, line and form, while Kingston School of Dance performers gracefully move to the melodies of Kingston’s local Harp Quartet. Surround yourself with breathtaking lake views and natural light, as you create and mingle with local artists and performers in the Malting Tower! All ages welcome. Learn the art of Chinese Block-printing! Peng Wang is a Chinese Canadian visual artist who works in oils, watercolour, block-printing and calligraphy. He believes that art-making is a way of finding stillness and peace within the mind. Drop-in to the Creativity Studios, and enjoy an afternoon of creative exploration and community connection! All ages welcome, free while supplies last. We invite you to join Arabic author, editor and visual artist Jamal Saeed for an exciting in-depth look at the many styles of Arabic Calligraphy. With various geometric shapes, it is an easy and beautiful style to write. To practice the art of calligraphy, you will experiment with common Arabic phrases and even use your own name. By the end of the class you will have gained new insights and skills, while having completed a series of customized postcards. All materials included. Spots limited, registration required. We will be reading excerpts from Plays! A whole bookshelf of Plays! Drop in anytime and stay as long as you want! Theatre Starts with the word. Today We CELEBRATE those Words! The Tett is fully accessible and welcomes all to join in on Culture Days 2018!